Who Drives A Landcruiser Around Here? As I have mentioned before, for the 2 of you who care/pay any attention, I have been looking for a vehicle that I can drive from Ohio to Virginia to visit my family. The last 2 miles are up a one-lane, gravel mountain pass, so I need a vehicle that I know can handle that in any weather. 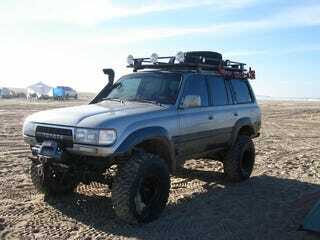 Toyota Land Cruiser and 4Runner. I really like the idea of a super-reliable vehicle that I need not worry about. I already have an automotive Poodle (2002 SVT Focus) that needs constant attention. I had considered the Saturn Vue with the 3.5L Honda V6 since I know that engine would run forever, but I am concerned with the less-robust nature of the Vue. My Dad had a Buick Rendezvous for a while and he popped a front shock through the strut tower on their road, so a more road-oriented unibody vehicle makes me nervous. Any other ideas? I want at least 6 cylinders, no premium gas, ~16-18+ highway MPG, 4WD/AWD, 4 doors, and legendary reliability. Budget is ~$7k; and I do not want to have to deal with any timing assembly replacements or diff seals for at least a couple years after purchase.